The following question has been playing on my mind for a while…. 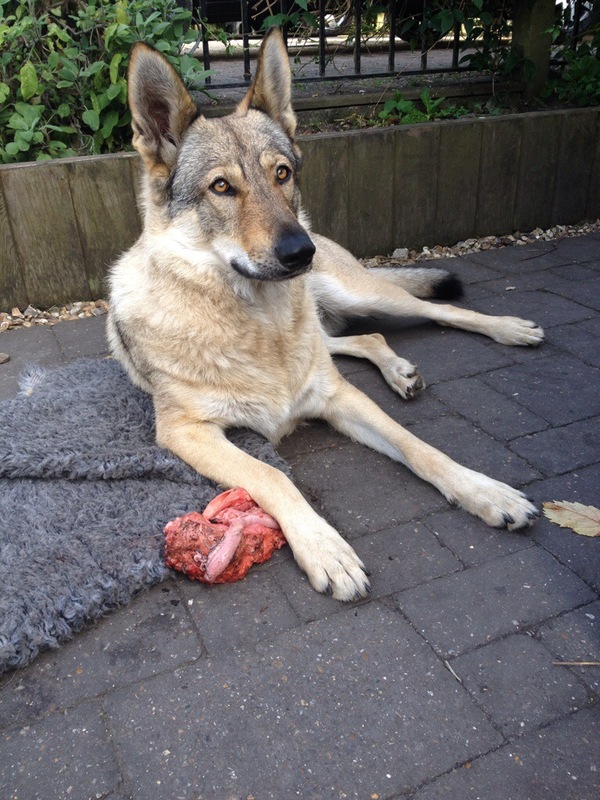 Why, if offal is so cheap to buy are the ‘natural’ offal treats so expensive to buy? 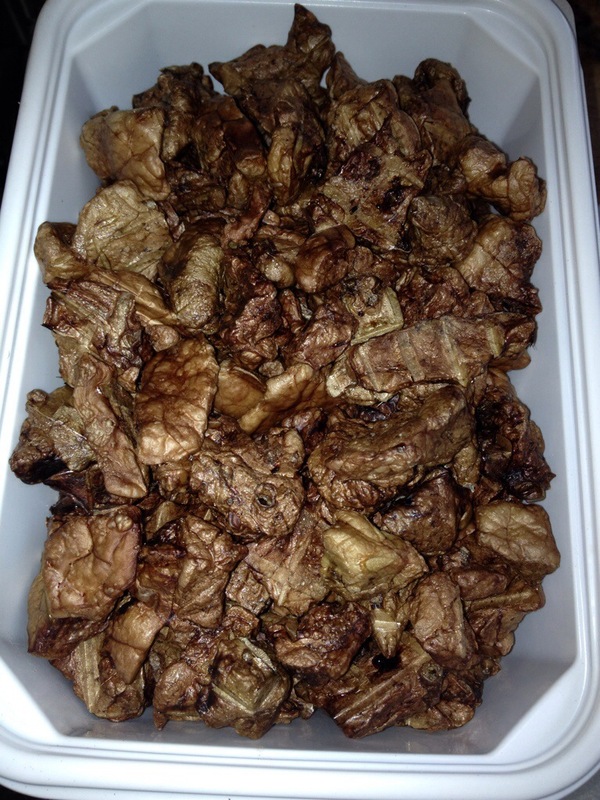 We have tried a few varieties and there is no doubt about it, all of our dogs LOVE dried offal treats, which is great, they are natural and fit in with the diet we try to stick to for our dogs of non processed foods. But WHY are they so expensive? Small bags can set you back around £5 and with 4 dogs that adds up fast! 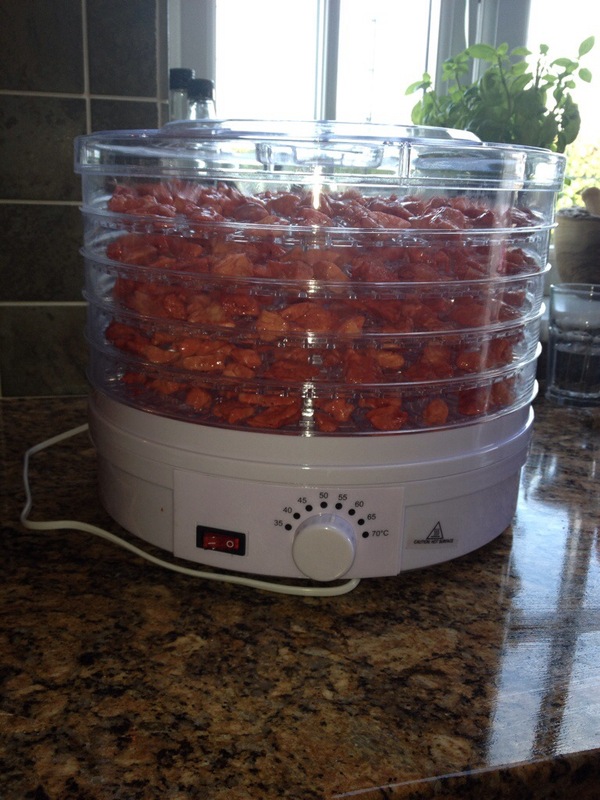 My lovely butcher sold us 2 pairs of cows lungs for 50p, I ordered a dehydrator from Amazon for £23 and I was good to go! 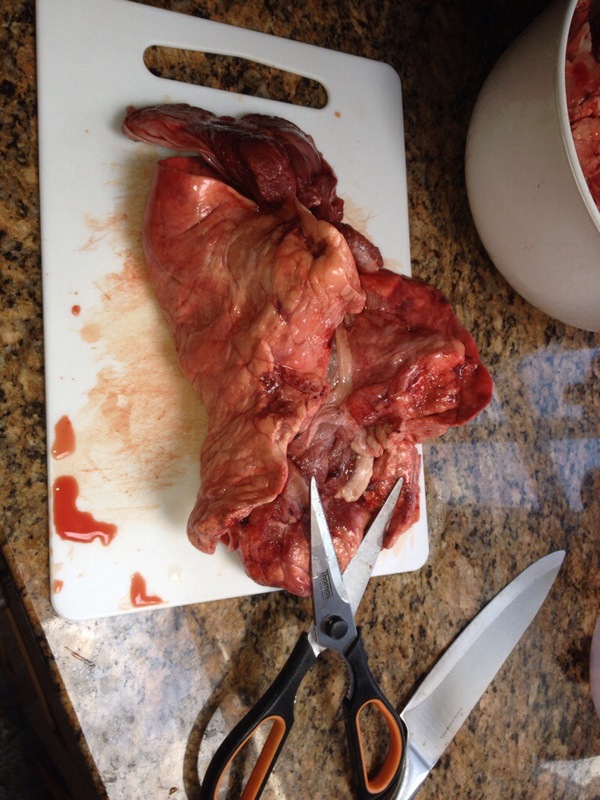 I chopped up the lungs in to small pieces using a pair of kitchen scissors. All the extra bits of cartilage, wind pipe etc. I gave to the dogs to snack on while I was busy chopping! I then spread out the pieces evenly over the 5 tiers of the dehydrator ( I had enough for 7 tiers in total), set the dehydrator to 65 degrees centigrade and went to bed. (We have economy 7 electric, so this costs next to nothing if I do it overnight). In the morning. 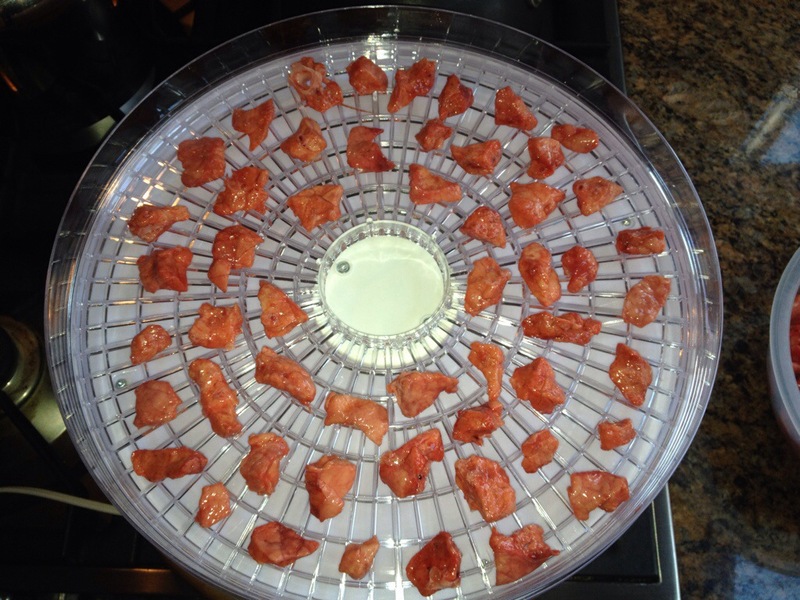 I turnedoff the dehydrator, let the lung cool and then put it in a tupperware. Thats it. No stress, nothing complicated, no skill, no fancy equipment. I made enough treats to keep my dogs happy for a month so I am pretty sure I will make the £23 back from purchasing the dehydrator in no time! 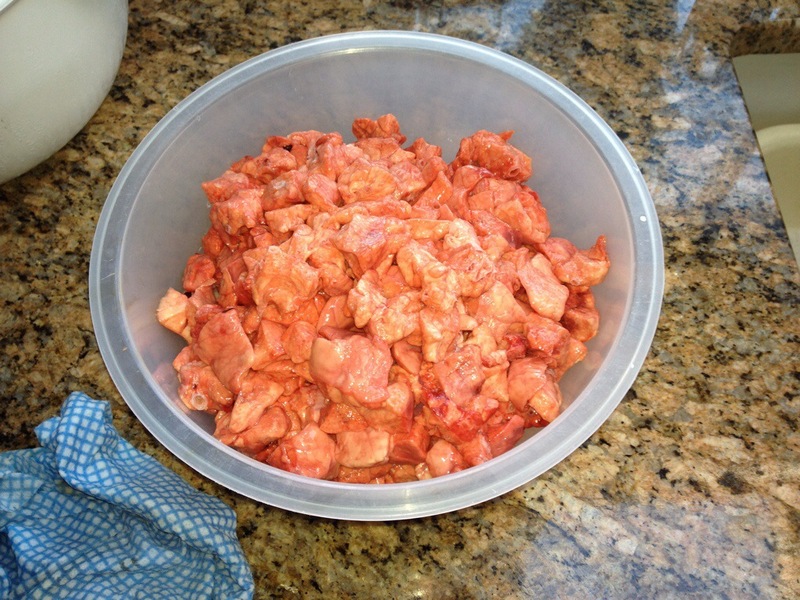 I have got some tripe, liver and kidney in the freezer ready for my next experiment! 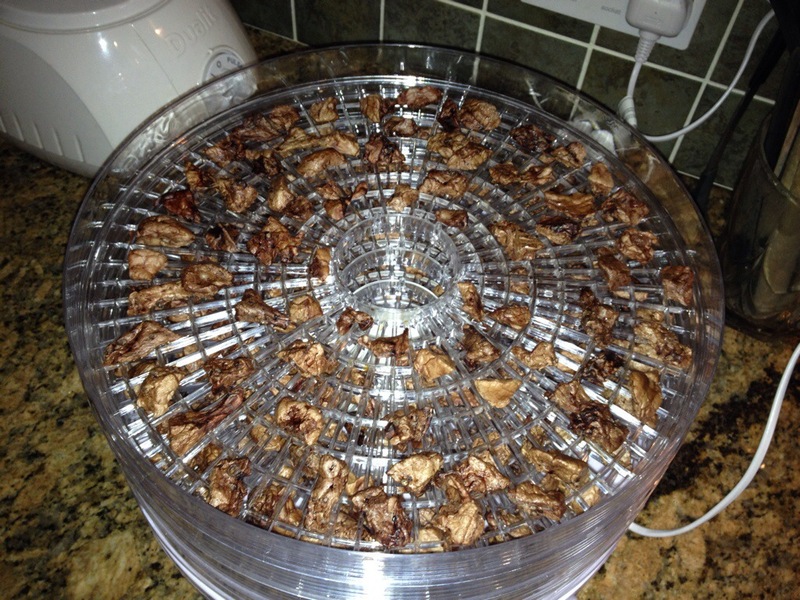 Fantasic idea, it really does make you wonder about the whole dog food industry though, they must be making an absolute fortune…..How much did the dehydrator set you back? It was only £23. There are much more expensive ones on the market, but I thought I would try out the cheaper one to see how well it worked and if I was likely to use it. Only £23.00, wow that does surprise me, absolutely worth getting then, where did you get it from? It was from amazon. 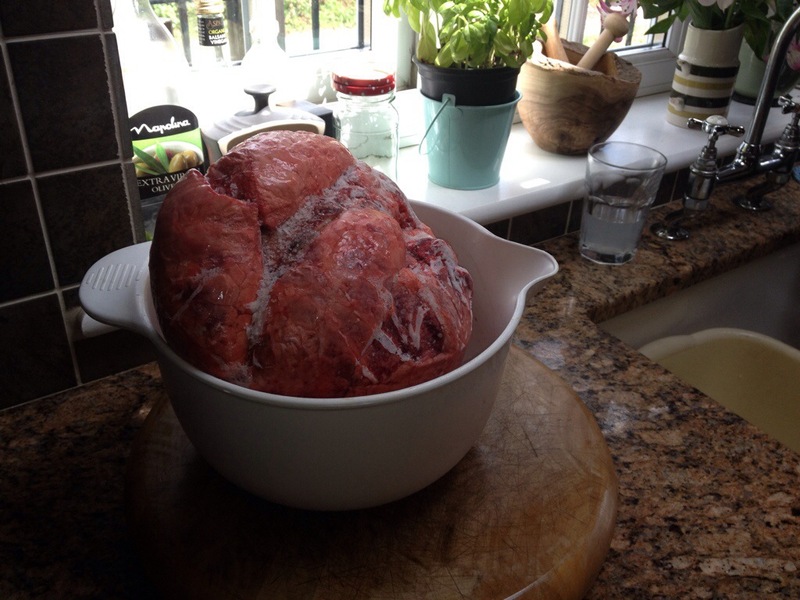 We did tripe in it this week too…..and it didn’t stink the house out! I dehydrate lung for my crew, as well. So much cheaper to do it at home, and they love it! That’s great! I can’t believe I have waited so long to try this out. Tripe tonight! 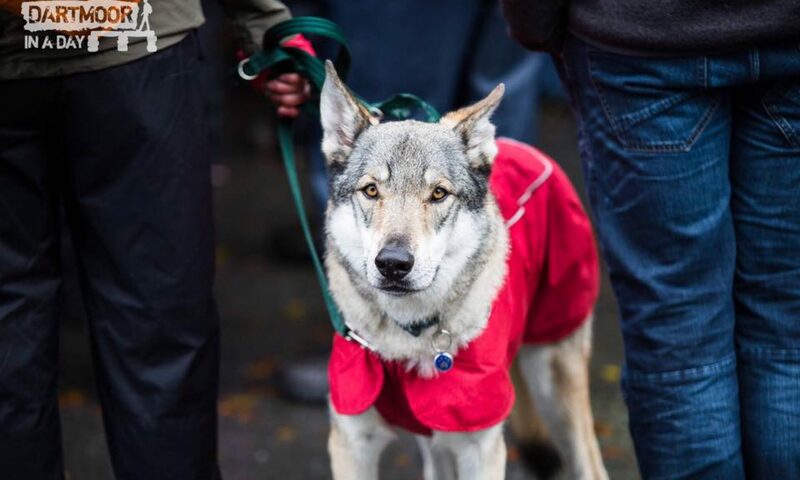 I have just checked out your blog, will be following it, looks great! So glad they liked it. The first time I did it I was so surprised at how easy it was it made me wonder why I hadn’t done it before and why more people don’t do it!